The Shippensburg Festival Symphony is an ensemble of professional musicians from Pennsylvania, Maryland, New York, and Virginia. 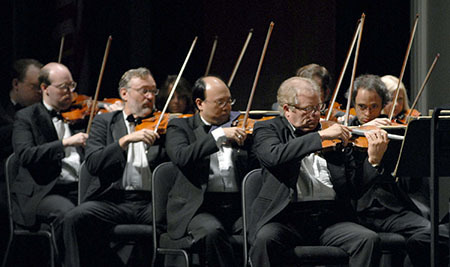 The orchestra was formed to provide regional audiences with top-quality professional orchestral performances. The Shippensburg Festival Chorus is 26 professional singers from Pennsylvania, New Jersey, Massachusetts, Maryland and Virginia. The Festival is under the artistic direction of Dr. Blaine Shover, professor of music at Shippensburg University. The Towne Singers, Chambersburg, will be performing with The Shippensburg Festival Chorus during Concert III for the first time this season. The singers have been providing quality musical programs in south-central Pennsylvania since 1970 and are under the direction of Dr. Blaine Shover. Founded by Jane and Chuck Butler, the group began as an ensemble of eight singers. Over the last five decades the group has grown to the current ensemble of thirty members. The singers are a diverse group of individuals representing a variety of ages and professions who share a common bond: The love of music. The training and experience is strongly reflected in the wide variety of musical styles presented in performance. Noted by Opera News for his “dark bass and strong dramatic energy,” the seasoned bass, Brian Kontes, returns to the Metropolitan Opera for the 2016-17 season for assignments in Manon Lescaut, Salome and in Der Rosenkavalier. This marks Mr. Kontesʼ seventh season with the company and he will be seen in his third HD broadcast production. Previous seasons have included roles in Die Zauberflöte, War and Peace, Die Meistersinger, Madama Butterfly, La Gio-conda, The Nose, and La fanciulla del West, among others. While at the Metropolitan Opera he has sung numerous performances under the baton of Maestro James Levine and made his debut under the baton of Maestro Valery Gergiev. Brian Kontes was a FIRST PLACE winner of the George London Foundation Competition and is a graduate of the Curtis Institute of Music. One of America’s most distinguished dramatic-coloratura sopranos, Amanda Pabyan has been described by the New York Times as “a brilliant coloratura” and “technically agile, clarion toned and incisive.” Ms. Pabyan made her Metropolitan Opera debut as the Queen of the Night in Mozart’s Die Zauberflöte under the baton of James Levine. She also appeared as the formidable Queen throughout the United States, most notably at New York City Opera, Washington National Opera, Opera Colorado, and Florida Grand Opera. Ms. Pabyan holds a Doctorate in Vocal Performance from the College-Conservatory of Music at the Universtity of Cincinnati, a Masters Degree in Vocal Performance from Boston University’s College of Fine Arts, and a Bachelor of Music degree in Voice from Rutgers University’s Mason Gross School of the Arts. Ms. Pabyan has made a recording of Italian Cantatas and German Arias, "Nel dolce dell'oblio”, with Callisto.